KLMEE 2019 - KL Marine Entrance Examination is a joint admission exam for admission at DG Shipping Govt. 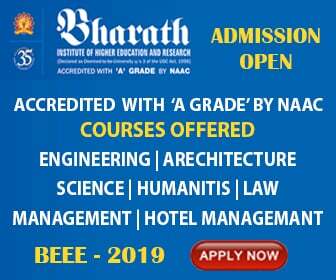 of India approved Institutes. Qualifying this exam will lead to admissions in B.Tech. Marine Engineering (4 Years) and B.Sc. Nautical Science (3 Years) Courses at Colleges in Chennai, Kolkata, Delhi, Mumbai, Pune, Mahesana, Kanyakumari, Jaipur, Udaipur & Dehradun etc. Chennai, Kolkata, Delhi, Mumbai, Pune, Mahensana, Kanyakumari, Jaipur, Udaipur, and Dehradun etc. Candidates can apply for KLMEE-2018 only through an online application process at KLMEE-2018 website www.Klmee.co.in. Candidates must positively download the admit card and carry it to the exam centre. No candidate will be able to enter the exam hall without the admit card.